I subscribe to a vegetable delivery program with FoodShare called the Good Food Box and received some great looking beets from Riga Farms. I love beets. I know that they can be messy to prepare and stain your hands and cutting board but I love the earthy, sweet taste and firm texture. I prepare beets to use in salads or borscht and would usually throw the stems away but you can cook those too! The beet greens can be cooked similarly to spinach or kale and the stems can be diced and sautéed. After washing and peeling them, I cook beets by drizzling them with olive oil and sprinkling them with salt and pepper. I either wrap them in foil or just place them on a pan with parchment paper and bake them at 350 degrees for 45 to 60 minutes until soft (a fork or knife should go through easily). You can also boil them (which is even faster). Wash and peel the beets and cut them in half. Place them in a pot of water and bring to a boil. Cook them for 20 to 30 minutes until soft. 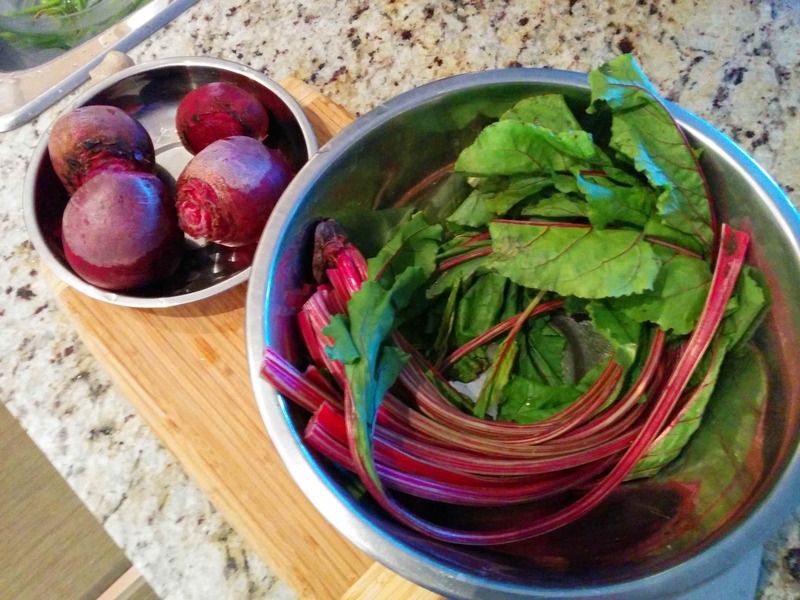 Cover beets with water in a medium size saucepan. Bring to a boil, then cook for 20 to 30 minutes, until tender. Drain and when cool, cut in to cubes. In a small bowl, whisk together the orange juice, vinegar and olive oil for the dressing. In the meantime, place the walnuts in a skillet over medium-low heat. Heat until starting to toast, then stir in the maple syrup. Cook and stir until evenly coated, then remove from the heat and set aside to cool. Place a large helping of baby greens onto each plate. Place equal amounts of beets and candied walnut over the greens, and top with dabs of goat cheese. Drizzle each plate with some of the dressing. 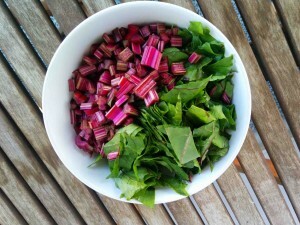 Wash the beet greens and separate them from the stem. You can chop or tear the leaves and quickly sauté them in oil with garlic, salt and pepper. Can you cook the beet stems? You sure can. The stems can be quite tough so it’s best to use the thinner stems or dice the thicker stems into small pieces (cut them lengthwise first and then cut them across so you get nice small pieces). These can be sautéed as well. Wash the greens really well. Drain greens and remove any heavy stems. Tear leaves into bite-sized pieces. Set aside. In a saucepan, cook bacon until lightly browned. Add onions, cook over medium heat approximately 5 minutes, stirring occasionally, until onions soften and start to brown. Add garlic and water. Stir in sugar and red pepper. Bring mixture to a boil. Add greens, reduce heat. Cover and simmer for 10-15 minutes. Stir in vinegar. Serve. There you have it. Ways that you can cook the entire beet including the greens and stems! 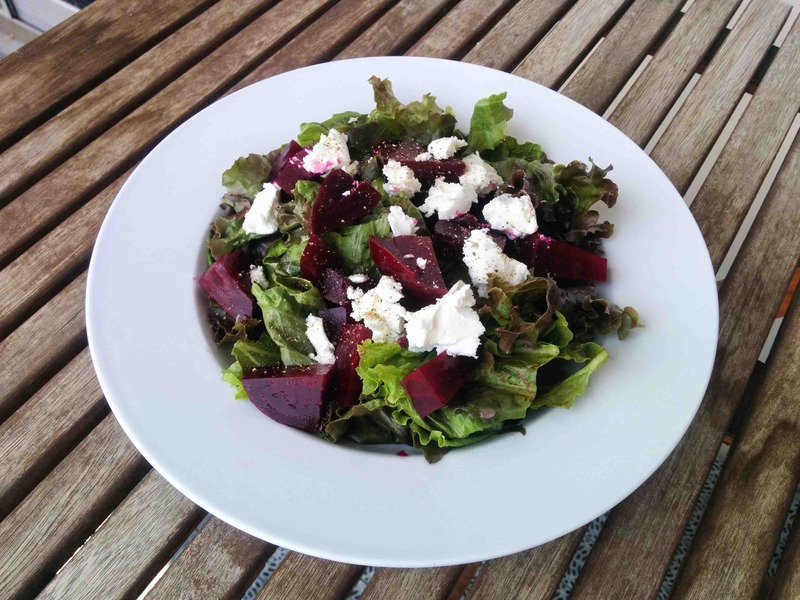 Do you have a favourite recipe that uses beets?